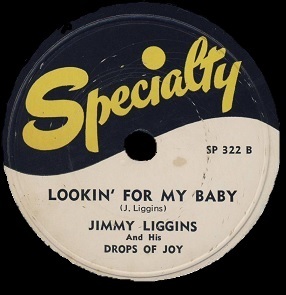 Five months into rock ‘n’ roll, back in January 1948, there was arguably nobody who was more poised than Jimmy Liggins to be the genre’s first breakout star. Granted the competition was rather slim then. The first national hit in the style had only just broke into the Billboard charts the second week of 1948 and most of the artists who were partaking in rock had released two records at the most, so it wasn’t like there was a lot to go on when making such a prediction. But there was enough shown over that limited time to at least get an indication of who might be in this for the long haul and which among them were vying for the lead coming around the first turn. It was basically a three man race at that point, well, six man race because The Ravens were a four man outfit unto themselves. But along with that group you had Roy Brown, the guy who started all of this mayhem back in September… and you had Jimmy Liggins, who while getting off the line a bit slower than those others, both in terms of timing (Brown’s September debut was followed in October by The Ravens first rock entry, and Liggins only issued his first sides in November), but also in terms of quality, as I Can’t Stop It, as good as it was, fell slightly behind Brown’s Good Rocking Tonight (if only for its groundbreaking qualities maybe) and The Ravens Write Me A Letter. Both Brown and The Ravens had more in the way of influence, though of course that wouldn’t be known until much later, but you could probably get a sense of it merely by how revolutionary their respective approaches were at the time. By comparison Liggins wasn’t showcasing anything completely transformative stylistically, other than ramping up the excitement a bit. When The Ravens, with Be I Bumble Bee Or Not and Brown with the two-sided gem Miss Fanny Brown and Mighty Mighty Man released very strong follow-ups to show their initial offerings weren’t merely flukes they were destined never to match it seemed they were pulling away from all competitors. But Liggins own sophomore record matched those, if not beat them, as Cadillac Boogie was a generational rallying cry that seemed to encapsulate everything about rock ‘n’ roll up to that moment, but also gave plenty of indications as to the type of celebratory hard-charging music it would forever be branded. What’s the purpose of this recap of events from 14 months ago other than to get you to click the song links to go back and re-read about those records again? Well, because by now, in March 1949, we have far more evidence with which to judge their respective careers and while both Brown and The Ravens made a few missteps along the way, they also released enough great records to validate the early returns on their first few sides and remain at the front of the pack. Liggins on the other hand has regressed, never approaching the heights he reached those first two times out. Yet he’s still here, still churning out decent enough records, even if his stylistic limitations – something Brown and The Ravens aren’t nearly as afflicted with – are holding him back. You keep waiting… hoping… that Jimmy Liggins will figure this out, change things up just a little melodically, maybe throw his guitar more into the mix to showcase another aspect of his sound, and that he’ll perhaps start making his move on the leaders coming down the stretch in the Rock Stakes of the 1940’s. So you’re not kept in suspense, he doesn’t do that here, though once again he doesn’t fall woefully short of that goal either. No matter how you attempt to spin his progression as an artist it’s now painfully obvious that he’s in a rut – creatively, conceptually, musically – as everything he releases harkens back to his initial moments of true inspiration, yet coming this far along his journey they’re little more than stark reminders of better days. He hasn’t advanced his approach to take into account the changes that have occurred on the larger rock scene over the past year. He’s effectively been stuck in neutral, if not gradually sliding backwards ever since. So while these records would’ve been slightly ahead of the curve in the winter of 1948, by the emergence of spring a year later they’re in danger of falling too far behind the curve for him to ever have hopes of catching up. Lookin’ For My Baby is emblematic of this. Taken independently of everything else he’s done, and removed from the context of rock as a whole in March of 1949 when so much had zoomed past him, this might fare a little better. The record shares many of the hallmarks from sides that we praised so long ago. The vocal delivery that carries the melody is eminently familiar to anyone who’s been keeping tabs on Liggins from the start and the theme is reminiscent of previous songs as well, finding Jimmy resigned to being downhearted, which seems most frequently to be his lot in life. So we know he can pull this sort of tune off, he’s done it before. Yet that’s the problem, he HAS done it before. The lyrics may change, but little else about each record does. He may experiment with a few different riffs from the horns but otherwise you could pull entire stanzas out intact and cut and paste them into previous records and probably wouldn’t pick up on the splices. In this instance the intro is new, a nice stuttering horn riff that offers early hope that he’s changed things up this time around. But it’s not to be for as soon as Liggins enters and the horns revert back to their usual supporting role everything takes on a sense of déjà vu. They lightly dance behind him, accenting his words without stepping on his feet. The piano may be featured a little more prominently here than at other times but it’s still not standing out and certainly not forcibly taking over. The differences I’m afraid are merely in the shading, not the overall construction. If Liggins, who was a decent, if somewhat crude, guitarist, was allowed to feature that instrument, delivering some jagged fills or harsher lead lines, or the pianist was given free reign to hammer away on the ivories, either establishing the bottom with his left hand or embellishing the melody with his right, then the entire vibe might’ve come across as different even if the song was otherwise much the same. That’s really all this would need to suggest a new listening experience for those buying the record rather than merely a new title to what is now the same old thing. But in 1949 when the means for reaching an audience was one record at time, released months apart, something that was still most often heard only sporadically at whatever juke joint you found yourself in with a nickel in your hand and twenty or more selections to choose from, and the dominant mindset in the industry was you gave the customer simply what had proven most effective in the past. So we get recycled goods, leftovers and hand-me-downs. The first horn solo is a little different, thankfully, from what we’ve heard before, a winding snake charmer passage that at least sets it apart from previous Liggins’ records, but that’s not to say its improved upon what they served up before. In fact considering the showy nature of the tenor sax over the past year this almost acts as a sedative rather than a kick in the pants. When Liggins returns the horns revert back to the same droning backing showing that nobody involved was aware of the importance of tying the arrangement to a song’s content and the audiences evolving needs. None of this is helped by Liggins limited vocal skills. Never the best singer to begin with, possessing a nasal baritone with limited range and nuance, he never ramps up his delivery enough, nor shifts down enough, to set it apart. He’s in second gear the entire way – in every song – and so they all blend together. Happy, sad, he sounds the same on everything he does and since he’s using the same melodic construct you wind up with the sense he’s not actually emotionally invested in any of it, but rather merely going through the motions. Because there’s nothing new to consider we wind up spending more time analyzing his singing itself and his deficiencies in that area become ever more apparent. What’s most damning is he seems to lack an awareness of how to best sell the underlying emotions of his lyrics. Consider the way he goes up a note at the end of the line “I’m looking for my baby she seems so hard to find”. Her disappearance is the central theme of the record, a situation that certainly isn’t welcome and in fact is cause for considerable distress. Yet by emphasizing the word “find” in that manner he changes the entire mood from one that’s despondent to one that’s expectant which renders what he’s actually saying all but irrelevant. It’s just one note, yet it’s a misstep that a more skilled singer wouldn’t have made. But listening to Liggins over the past year and a half it’s one he makes routinely in his songs. He clearly doesn’t even realize he’s doing this, or the negative effect it’s having on selling the emotional content. He’s not doing it intentionally with a clear purpose in mind, he just wasn’t skilled enough to understand its implications, that is if he was even aware he was doing it in the first place, which is doubtful. His style is unchanging from song to song, he simply barrels along often oblivious to what the meaning of the words he’s singing. When the lyrics and instrumental arrangement matches his delivery, the results are wonderful, but when it doesn’t, even if the other components are still good, it undercuts the overall effectiveness. By now it seems to be an all but insurmountable obstacle and something that was in danger of sinking his once promising career altogether. Oddly enough this drawback wouldn’t be what curtailed his career however. As this was released he was poised to see a song of his enter the national Billboard charts but tellingly it – like his first hit a year earlier – wasn’t a rock song, but rather the blues ballad Careful Love on the flip-side of his last effort. It barely slipped into the rankings, in the last spot and only for one week, but none of his rock efforts had managed even that. After this would he even bother to continue trying to connect with an audience that seemed indifferent to his work in their realm, or turn his attention fully to the one which had been more appreciative? Keep in mind that this was a time in which neither genre was exactly at the top rung of the ladder, but like rock was in the process of doing, the blues were seeing their own commercial fortunes on the upswing. Liggins forays into that were unique to a degree, blending some pop attributes in, but they were not at all half-hearted or misguided. These were decent songs and performances and – believe it or not – they showed a little more vocal versatility than his rock sides had to date. I don’t think for a moment he was a better blues artist than a rocker, but I’ll say he was equally effective in both. So when it was the blues offering that cracked those charts in the middle of April while his rock sides missed out might he have had his decision as to which road to take made for him? Alas we’ll never know. For just as that song was about to peak Liggins own career almost came to a violent end. While playing a concert on April Fool’s Day in Jackson, Mississippi Liggins was shot in the mouth during a fight that broke out while he was on the bandstand. The bullet severed his tongue, broke his jaw and lodged in his neck. Though certainly not the best state for a black man to receive medical attention Liggins managed to survive. He lost four teeth and somehow the tongue was reattached in working order. Though out of action for a considerable amount of time, Liggins made a comeback and his work – in both blues and rock styles – began to progress further, as if his time convalescing gave him time to study what worked and what didn’t, analyze the musical landscape and perhaps experiment with different deliveries as he worked his way back into shape. But we’ll have plenty of time to get into all of that in the future. For now Lookin’ For My Baby provides us with a last chapter on the first half of his story, but thankfully not the last chapter in his life or career altogether. Though the song suffers from many of the same drawbacks that undercut his earlier sides it also contains enough of what made his work to date still pleasing and occasionally great and so while this isn’t the best way to leave him for now it’s with a sense of relief that we know we’ll be meeting him again down the road. I have to agree with your “5.” A record as sedate as this couldn’t hope to compete with “Deacon’s Hop” or “Drinkin’ Wine.” Jimmy and the band here seem to placidly chug along with no particular destination in mind; not a good idea when rock ‘n’ roll’s just getting wilder and rougher. Still, the song’s pretty catchy and I do like the solos. Leave a reply on "Jimmy Liggins: “Lookin’ For My Baby”"